Welcome to the updated Shop, Play, Win!® MONOPOLY App. With the Shop, Play, Win!® MONOPOLY app, participants may use the app to (1) register for the MONOPOLY online game; (2) enter and track their MONOPOLY online codes; (3) scan game ticket codes they receive; and (4) find Rules & Odds Charts, Winners, Frequently Asked Questions, Prize Submission Forms, Privacy Policies, Customer Service, etc. 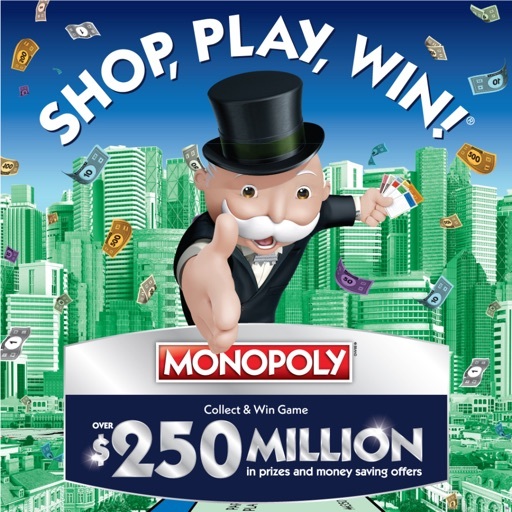 The Shop, Play, Win!® MONOPOLY app may be used only in association with the MONOPOLY Collect & Win Game at participating Albertsons Companies, LLC banners (Acme, Albertsons, Albertsons Market, Amigos, CARRS, Jewel-Osco, Lucky – Southern CA only, Market Street, Pak ’n Save, Pavilions, Randalls, Safeway, Shaw’s, Star Market, Super Saver, Tom Thumb, United Express, United Supermarkets, VONS, Haggens).